In early summer I ordered two ‘behind the scenes’ baseball books from Amazon. If I remember correctly, I stumbled upon these by accident, and I’m glad I did! Both books happen to be indirectly related to my Milwaukee Brewers historical book project. I bounced back and forth between the two books, and have to admit it took all summer to finish reading and then write the review that follows. Even though I got off track reading for a number of reasons, I was able to re-engage with these books easily as they each had a comfortable pace. The back cover of the book states: “My day-to-day existence,” writes Kathleen Lockwood, “rested on the ability of my husband to throw a tiny leather ball over ninety-five miles an hour past a large wooden bat.” If that sounds like hyperbole, consider this: In the 12 years that followed their wedding in 1970, Kathleen and major leaguer Skip would move 35 times. The couple and their growing family endured three player strikes, a handful of trades and trade rumors, and the steady threat of a career-ending arm injury. Kathleen built lifelong friendships with other players’ wives, managed their homes and cared for their children, and shared in the cycle of triumph and defeat that is life in the major leagues. Let me start by saying that IT IS NOT NECEESARY TO BE FEMALE TO READ AND ENJOY THIS BOOK! Obviously this was written from a female perspective and Kathleen is quite eloquent throughout. Yet she still manages to come across as a family friend, and does a fantastic job of summing up her thoughts and feelings through each passage. The time period (mainly 1970’s) is apparent as we learn of her husband’s contracts and what the baseball league minimum salary was at the time. Being “set up for life” via a big contract was a different story back then, as it certainly didn’t happen often – and not for the Lockwoods. 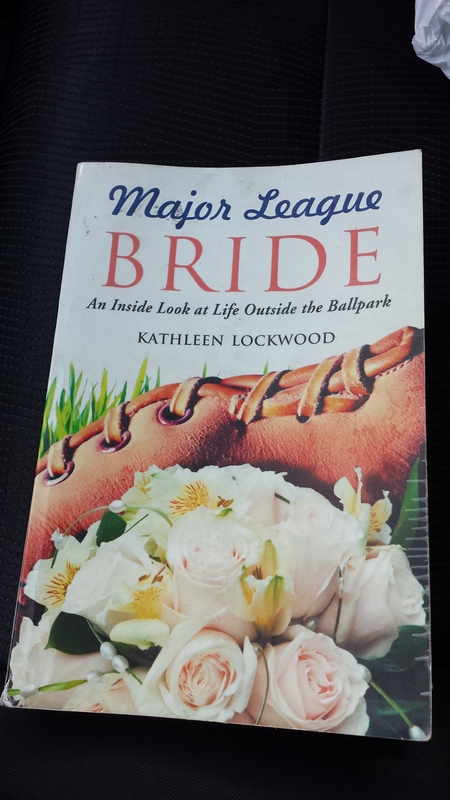 I found Major League Bride to be refreshing, and worth the screwed-up looks I got a couple times when people saw what I was reading! I honestly learned a lot about what happens with a baseball wife (and family) while the husband is off playing baseball. Kathleen did a fine job of describing the many places they lived, and also the various ballparks where Skip pitched. I could also tell the sense of camaraderie the player’s wives/girlfriends shared, and this extended to providing housing and support during baby delivery. Unfortunately this camaraderie wasn’t the case everywhere Skip pitched, and it almost seemed to depend on the city/team as to whether the women bonded or not. I started reading MLB mainly because Skip pitched for the Milwaukee Brewers from 1970-73, before being traded to the California Angels. By the time that trade happened in the book I was already looking forward to learning more about not just Skip’s career, but the Lockwood family in general. Kathleen wraps up with a nice Epilogue of what happened to the family after Skip’s career ended. The only thing I’ll give away (in case you didn’t already know) is that Skip became one of the rare ballplayers to graduate from MIT. Kathleen battled and beat breast cancer. According to her bio on Amazon, she is working on a book relating to that time period, and will be sharing inspiring stories of empowerment. I predict another great book from Kathleen Lockwood! Excerpt from the cover flap: A clubhouse is a safe haven where ballplayers can be themselves without worrying about the scrutiny of fans or the intrusion of reporters. From 1966 to 1997, author Jim Ksicinski was the keeper of such a sanctuary at Milwaukee’s County Stadium, where he served as headwaiter, valet, and confidant for hundreds of major-league players and coaches. 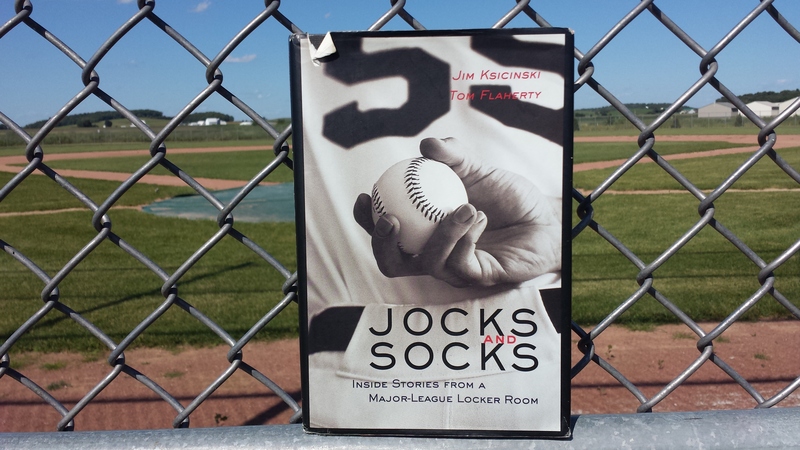 In Jocks and Socks, Big Jim (as he was affectionately known in baseball circles) opens wide the clubhouse doors and shares some of his most memorable baseball moments: the players, the personalities, and the pranks. His candid stories prove that the action in a big-league clubhouse can sometimes be more interesting than the action on the field. I thought this was also a great read with a pleasant conversational style and pace. I don’t know for sure, but assume that Jim shared his stories with Tom Flaherty – then Tom edited everything. However the book was put together, it’s hard to tell where Jim leaves off and Tom takes over. Tom, by the way, covered baseball for more than 25 years as a sportswriter for the Wisconsin State Journal and the Milwaukee Journal. I discovered many things I didn’t know about the inner workings of a clubhouse. Although the title is Jocks and Socks, there are a lot more things to take care of besides insuring those particular items are clean! I felt like part of the scene, privy to the conversations and hijinks as well as the hard work. For anyone hoping to learn more about Milwaukee Brewers players, this may not be your book. Jim ran the visiting team clubhouse, and while he did have interactions with Brewers players, the focus of the book is on opposing players and managers – and the umpires. He has stories involving the whole spectrum of players, including everyone from Hall of Fame players to lesser known backups. Many of the regular visitors to Jim’s clubhouse became good friends, sharing stories of families, vacations, and even investments. My only warning is over language. While this book isn’t particularly raunchy, it does have some colorful language and a few mentions of body parts. If you’re thinking of giving this to a youngster, discretion is advised. Otherwise it offers great insight into another overlooked aspect of our National Pastime. Jim even closes out the book with his All-Time Teams, which lists tops in Class, Tips, and much more! On a side note from the book, I conversed with Jim via email and that lead to me interviewing him for my Brewers book. Big tip of the cap to Jim for a lot of great information!